Poland’s answer to pizza comes in the form of a crispy and cheesy baguette! The trip last week to Poland rekindled my love for the famous Polish street food zapiekanka! 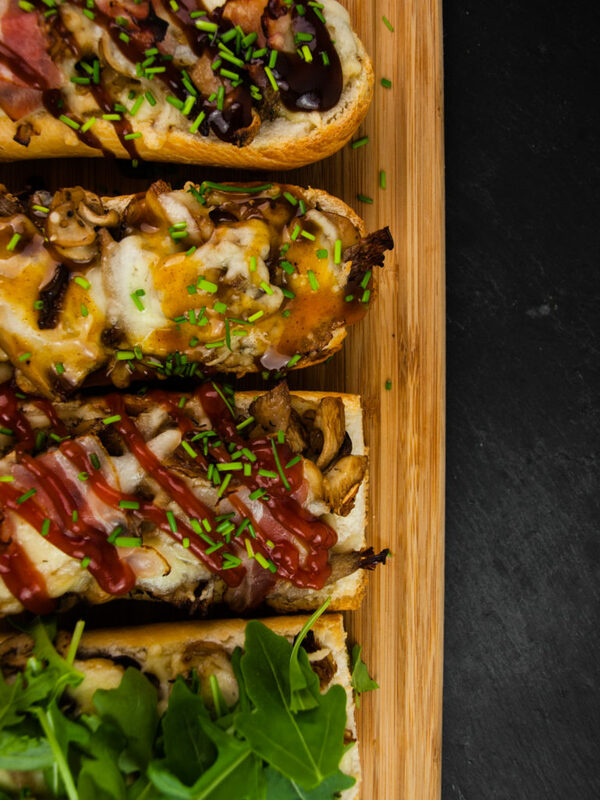 Zapiekanka is basically Poland’s answer to the beloved pizza – a baguette that is usually topped with a base of hearty mushrooms, lots of melted cheese and then decorated with a zigzag pattern of Polish ketchup. It’s the perfect food for after a long night out and after all the bars close you will see people everywhere stuffing themselves with these arm-long pizza sandwiches. And why wouldn’t you if 2 Euros provide you with about half a meter of delicious, crunchy, gooey pizza?? There are countless different varieties ranging from vegetarian options topped with arugula after baking, to Hawaiian with ham and pineapple, to Greek with feta and olives. Sliced meats work very well on the sandwich, but the same is also true for all kinds of vegetables. Whatever you have at hand will probably work quite well on this versatile pizza sandwich. …no wonder zapiekanka is so popular amongst students with their empty fridges. What are you waiting for? Raid your fridge and make some delicious Polish street food at home! Optional toppings: bacon, ham, salami, spinach, bell pepper, pineapple, etc. Create Polish pizza goodness with lots of melted cheese! Dice the onion and garlic, and then thinly slice the mushrooms. Put a pan on medium high heat, add the oil and fry the diced onion for 2 minutes. Increase heat to high, add the mushrooms and brown them 5 minutes, stirring occasionally. Stir in the garlic and cook for another 2 minutes. Season with a generous amount of black pepper, salt, as well as the thyme, rosemary and red chili pepper flakes. Stir to combine and remove from heat. Preheat oven to 250°c (fan works best for an even brown crust) and halve your baguette lengthwise. Spread your mushroom mixture onto the cut-side of the baguettes and cover with grated cheese. Optionally, if you are using other toppings put them on top of the cheese. Place baguettes in the oven and bake for 5-10 minutes until the crust is golden and cheese becomes bubbly. Generously slather your zapiekanka with a sauce of your choice and garnish with pickles and some chopped chives! Let us know what you think of this zapiekanka! Have you ever had them before? What ingredients and sauces do you think should go on a zapiekanka? Share your thoughts with us underneath.